The Domain Name System, or DNS for short, is a directory of domain names with the IP addresses they are linked to. There are already a few DNS providers to choose from, outside of the default servers operated by your ISP, but it’s always nice to have more options. The CloudFlare has launched its own DNS service earlier this year, and now AdGuard own DNS Service officially Released. The AdGuard has been testing a DNS service since 2016, but now the company says it’s ready for prime time. It supports both DNS-over-HTTPS and DNS-over-TLS — the latter of which works with the Android 9 Pie. That means you can set the AdGuard as system-wide DNS provider on any device running the latest version of Android. As you might guess from the name, the AdGuard own DNS also filters traffic from the servers known to host advertisements or tracking scripts. 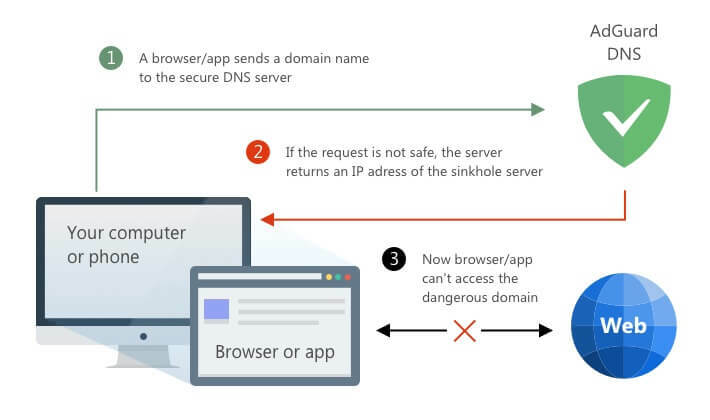 Two versions of AdGuard DNS are available — Normal version and ‘Family protection‘ version. The latter option adult content blocks and enforces the Safe Search in web search engines, in addition to the usual traffic filtering. You can find instructions for the setting up either option at the source link. If you have a Smartphone or tablet running Android Oreo or older, you can still use the AdGuard App for Android.